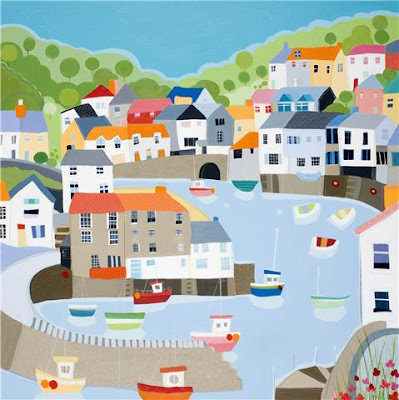 I just finished this commission of Polperro in Cornwall for a lovely couple. Polperro is one of the strangest, most delightful places I have ever been to in Cornwall. It had an almost magical feel to it, I can't describe it. Its made up of higgledy piggledy houses which of course I love but it seems such a creative little hub. It seems like the locals really really care about their village. There are no big corporate companies there so far, and that the way they like it. 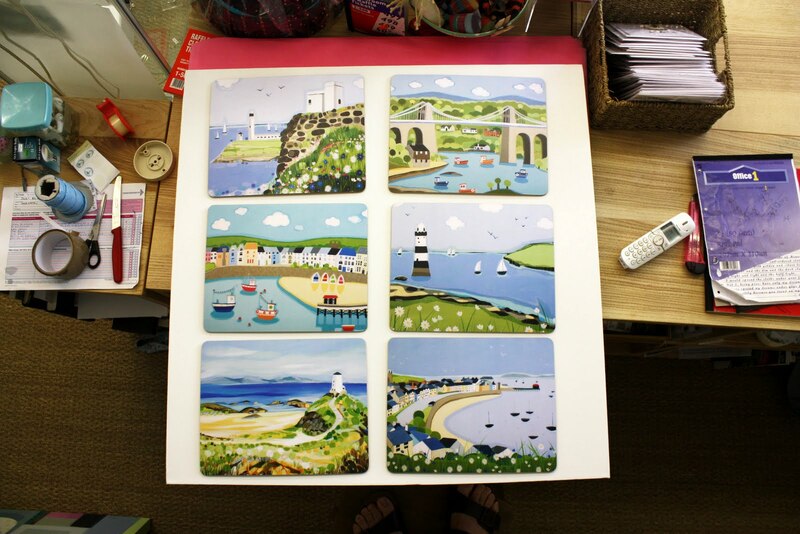 This photo made me smile, lovely hubby was taking photos of our new placemats to go on the website but if you look closer you can see his funny little feet in the picture. I say funny little feet because I always tell him his toes are so straight you could use them instead of a spirit level. Then someone recently told him he had the most perfect feet they had ever seen. DOH!!!! Oh, he LOVED that!!! If you happen to be in Brighton, I have some originals and prints in the Yellow house Art open house as part of the Brighton festival. Over 243 venues are showing the work of over 1000 artists, amazing. Just wish I could go down to see some great art and craft. Wonderful painting - what a lucky lady that is getting that as a pressy. 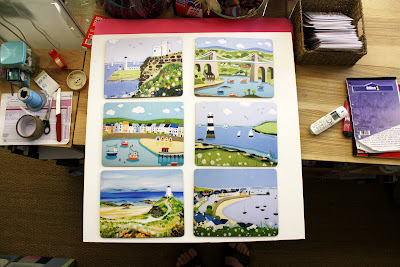 And the placemats look great too - as do your husband's perfect feet- how funny! Lovely painting Janet! I'm sure the lady in question will love it. In fact how jealous am I! I've got my fingers crossed for some bank holiday sunshine too! :) Lets hope it's a scorcher for all. I hope my husband buys me something that nice for my birthday. Your paintings are so lovely Janet, so colourful and cheerful - Im sure the lady you painted it for will be over the moon happy with delight when she receives it! Ha poor Sean - funny feet, but sturdy feet! Put those funny feet up tonight on a foot rest and poor yourself a lovely cold one, you deserve it!